Twenty-year old Lucas Nord is a rising star within the Swedish house music scene. Already achieving great success in 2012 in his native land for his first two solo singles ‘Let us Stay Young’ featuring Urban Cone and ‘Close To You’ featuring And Then, Lucas has also made an impression with his remixes for acts such as Adrian Lux, Loreen and Rasmus Faber and is currently on the dials for Crystal Fighters. As the grandchild of legendary jazz clarinet virtuoso Putte Wickman, Lucas is not only a DJ and producer but also a songwriter, co-writing the track ‘Embrace Me’ for fellow countryman John Dahlback. 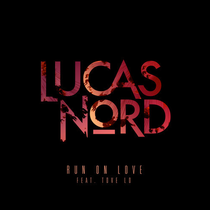 For the second single from his debut album, Lucas has teamed up with Tove Lo for ‘Run On Love’; an happy summer track showcasing Lucas’ production skills, Tove’s vocal melodies, and the pairs penchant for uplifting song-writing. Lucas’ trademark synth work and punchy, funk-laced production collides with Tove’s sweet pop tinged vocal melodies for a song that aims to capture the tender beauty of young love. Accompanied by a POV style video that documents the highs and lows of summer romance, plus a selection of club friendly remixes, the track is out now on Hybris. Check it out below.